- Tickets include an event bag with Crawl goodies, and admittance to all stops on your selected route (includes a drink sample, and short, educational presentation at each stop). 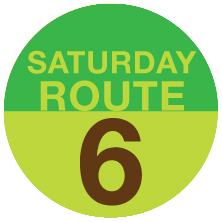 You will receive the event bag at the start of your route. - Each stop along the route has a set start and end time that was confirmed with that business, and will be provided to you the week leading up to the event. This is to keep the event organized, and give each ticket holder the best experience possible. Please be prepared to stay on schedule and follow cues from your tour guide, as there will be multiple routes in operation at once. 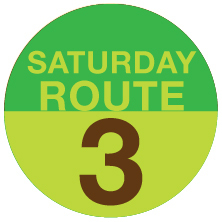 ​Route 5 is sold out. This is a 10 mile driving route that visits 5 different stops. It begins at Anelace Coffee (2402 Central Ave NE, Minneapolis, MN 55418) at 1:00pm, sharp! Other stops include Spyhouse Coffee Roasters, UP Coffee Roasters, Bootstrap Coffee Roasters, and J&S Bean Factory. This route ends at 4:15pm. You provide your own transportation shop-to-shop. Check your email associated with your purchase for exact details. This is a 12 mile driving route that visits 6 different stops. It begins at Jaur Cafe (new shop - 609 10th St., Minneapolis, MN 55404) at 9:00am, sharp! You provide your own transportation shop-to-shop. Check your email associated with your purchase for exact details. This is a 10.5 mile driving route that visits 6 different stops. It begins at UP Coffee Roasters (1901 Traffic St NE, Minneapolis, MN 55413) at 10:00am, sharp! You provide your own transportation shop-to-shop.